Bush Lima Beans mature more slowly about 10 to 15 days later than Pole Lima Beans. When planting the soil temperature needs to be warm (65°+ F) to ensure good germination. They suffer in arid and semi-arid areas unless you can cool the area with shade. 'Dixie Butterpea' - white seed with 3 to 4 small plump beans per pod. Does well in hot weather. This variety is large and vigorous plants. 'Early Thorogreen' – flat, small, rich-green baby Lima. Very productive. Very adaptable and vigorous. 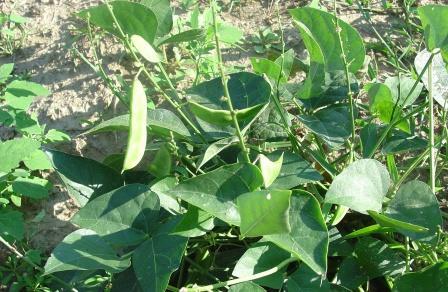 'Henderson Bush' - white seed; 3 to 4 small, flat beans per pod. This is the most popular variety. Small plant and productive. 'Jackson Wonder' – small peckled bean with purple markings. Medium-sized plant. 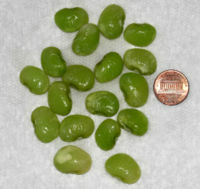 'Nemagreen' - seeds greenish-white; 3 to 4 small, flat beans per pod. The plants are small, productive; similar to 'Henderson Bush'. Resistant to root-knot nematodes.